I was lucky enough to spend a few hours one long afternoon with this little short-tailed weasel. I’ve hardly ever had to work as hard as trying to photograph this little fellow. Weasels are like ferrets on crack. Unbelievable energy. They stop for a second, glance around, and take off again, top speed, racing around, darting this way and that, pausing momentarily again, before charging headlong into some tiny crevice or tunnel to chase some unhappy lemming or similar-sized rodent. I followed this weasel down the coastline, as he patrolled the bank by the side of the ocean. He seemed completely unperturbed whether I was close to him or further away. He’d stop, casually glance my way, look around in all directions, and race off again, sometimes towards me (they seem extremely curious), sometimes in 3 directions at once (it would seem). I scrambled along behind, best I could, trying vainly to keep up with the weasel. Sometimes he’d be gone underground for minutes at a time, and I’d pass him, look around, stop and wait, and before long he’d appear from nowhere, sometimes behind me, sometimes in front of me, always carrying an urgency that belies how hungry he must be. What did become apparent, to me, was how quickly the weasel accepted me being a part of his day – he seemed to almost be stopping to wait for me at times, looking over his shoulder, scampering back towards me a few steps, then turning back, running a little, finding another hole to disappear into. It was a blast photographing this little guy. I was using my 70-200mm lens, a relatively short lens for wildlife. but I really don’t think I’d have had any luck at all with a longer lens, I needed the speed, mobility and ease of use of a handheld lens. the Nikon 70-200mm f2.8 lens was perfect. A few other short-tailed weasel photos. Short-tailed weasels are voracious little animals, and prey on a variety of species, including some animals more than twice their size. 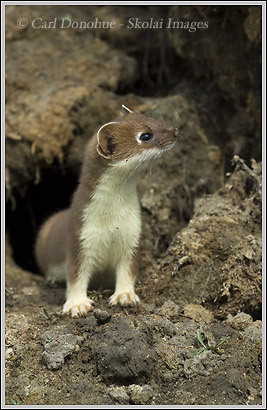 They’re also known by common names such as ermine and stoat, but these names also refer to long-tailed weasels. The latin name of the short-tailed weasel is Mustela erminea. This entry was posted in Adventures, Alaska, ANWR, Environmental Issues, Wildlife on May 31, 2007 by Carl D.
You did a great job with this one Carl! I’m sure it must have been a rush. We’ve got these buggers around my parts as well, but they are extremely skittish and impossible to get close to without a blind. Thanks for the post. Yes, it was a rush. These little fellas are SO cool. I’ve often seen them in the backcountry – well, not “often”, but a handful of times, and they’ve usually not been too skittish .. but they just move so much, and so fast, that photographing them is ridiculously hard. Tthis was the first time I’ve even got close to getting decent photos of a weasel. Great shot Carl, you must have been going nuts with this opportunity. It was a blast, man. Way, way, WAY too much fun! Thanks for your post Mark. Thank you for putting up the pictures. Several years ago, before our rural area began becoming suburban, we had one of these little sprites living around our front yard. He would delight me by running the fence, watching me attentively—but characteristically fearlessly. I know it’s more than a year since you posted….I found it today as I searched for pictures and was delighted to find you! Thanks for the post – I’m glad you found the photo.